Benbrookhorn has updated his great Texas football roster breakdown for the 2009 season. Every position is broken down by class and it includes the incoming 2012 seniors and even the 2013 targets. Useful. The Longhorns enter this year’s [tag]Fiesta Bowl[/tag] as the favorites. Texas wants to prove a point and make a case for a split National against a team with great name recognition. Many are overlooking [tag]Ohio State[/tag] and the third ranked Longhorns are going to need more than [tag]Colt McCoy[/tag] and [tag]Brian Orakpo[/tag] to finish the season with a victory and a likely number two ranking. The sophomore from Longview has looked quicker and more explosive as the season has worn on. The feeling is that McGee has finally been healthy. With [tag]Foswhitt Whittaker[/tag] back in the lineup the onus is not all on McGee to produce in the run game. It has appeared that he does not relish the number one role. That is not necessarily a bad thing, not all backs are made to be work horses. McGee will come into the game and run hard. With Ohio State having to use linebackers in pass coverage expect the Longhorns to use the pass to set up the run. As the game goes on Texas should look to use the run game in similar fashion to their game against [tag]Oklahoma[/tag]. McGee has shown a nose for the endzone and we’ll look to add one Monday night. Texas will face the best cornerback in the nation when they face the Buckeyes’ Malcolm Jenkins. The Thorpe award winner will likely matchup with [tag]Quan Cosby[/tag] for most of the night and the coaching staff is sure to focus on taking [tag]Jordan Shipley[/tag] away. This will force Texas to use another option, and with none being available at tight end, it will have to come from one of the extra receivers. Ohio State is physical in the secondary and out of all of the Longhorn receivers Williams possesses the best skill set to offset any advantage the Buckeye corners may have against [tag]Brandon Collins[/tag] and [tag]James Kirkendoll[/tag]. 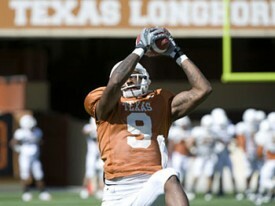 Williams has shown the ability to get deep; I believe Texas will try to take a shot early in the game. Alexander isn’t going to start, and he may not even play a ton of snaps. But this may be the best chance for Alexander to show his stuff heading into a crucial offseason for his career. The big nose tackle is a prototypical off center one gap tackle. The offenses that Texas faces in the Big 12 limit his effectiveness because of a lack of lateral speed. 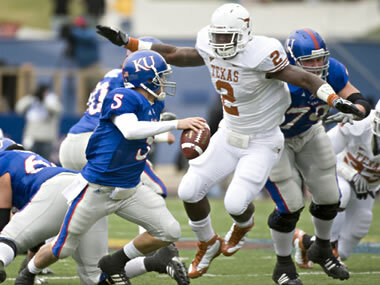 For the first time maybe all season, Texas is going to face a team that will show a heavy dose of downhill running. Texas’ two other tackles not named [tag]Roy Miller[/tag] are former defensive ends. Will Muschamp will need the size of Alexander on obvious running downs throughout the game. If Alexander can take up blocks and hold his gap it will help the Longhorn linebackers control Ohio State’s ground game. Much like Alexander, Norton finds himself a duck out of water when he faces the offenses in the Big 12. Norton excels playing downhill at his middle linebacker position and may in fact be the best NFL prospect of the group. Unfortunately for Norton, in the Big 12 a linebacker needs to play well laterally and in space. Norton to this point has had a hard time in both of those categories. Enter Ohio State and Beanie Wells. This will be a game Norton can thrive in. [tag]Rashad Bobino[/tag] will likely get the start as the senior, but if Ohio State has success running the ball early, and maybe even if they don’t, Norton will become a factor in the game. The junior will be a sure starter next year and we’ve seen how a good bowl game can propel a player into a great offseason. A lot of people think the true freshman from Leander’s job is in jeopardy this offseason. Most still view Gideon as an overachieving two star recruit who is playing because of his brains and intangibles. The talk heading into the spring will depend a lot on how Gideon plays in this game. If he comes out and plays a good game and makes a play or two the talk will quiet, but if he struggles or [tag]Christian Scott[/tag] makes a huge play one of the major offseason hot topics will be the status of Gideon’s job. The word is the only thing holding Scott back is his work on the practice room and in the film room, if the light turns on in year three on campus the super athletic Scott will be in line for many more snaps in 2009. If he isn’t a transfer could be possible. It wasn’t the greatest game for the Longhorns individually. In the heartbreaking loss to [tag]Texas Tech[/tag] only Malcolm Williams had the kind of night you brag about to your friends. Most weeks it is a struggle to settle on the top 11 players, but this week it was a struggle to simply find 11 players to put on the big board. [tag]Malcolm Williams[/tag] – All year Texas’ offense has searched for a legitimate deep threat out of their third receiver. Many around the program felt that the guy would be red-shirt freshman Malcolm Williams because of his size and speed. Saturday Texas found their deep threat, but it took Quan Cosby getting hurt to do it. Williams had without question his best game as a college player finishing with 182 yards on four catches including two touchdowns. [tag]Colt McCoy[/tag] – Colt McCoy entered the Tech game as the clear leader for the Heisman trophy, and while Texas lost and McCoy didn’t play his best game he still led his team to a potential comeback. McCoy finished the game 20 of 34 for 294 yards and two touchdown passes. McCoy’s struggles came in large part to his offensive line getting manhandled all night. He was sacked four times. [tag]Sergio Kindle[/tag] – It wasn’t a great day for the Texas defense, but Kindle made some plays. Kindle finished with six tackles, a sack, and a forced fumble. The Texas defensive line failed to get pressure throughout the night giving Tech’s offense all the time it needed to make plays. After Brian Orakpo went down with an injury Kindle was being used almost exclusively at defensive end. [tag]Jordan Shipley[/tag] – Down 5-0 in the first quarter Shipley dropped a deep pass that would have given Texas the early lead. After that play Shipley played a pretty good game. 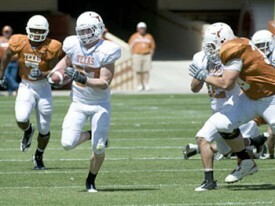 He got Texas back in the game with a punt return for a touchdown in the second half. Shipley ended his night with six catches for 45 yards. [tag]Roddrick Muckelroy[/tag] – The Junior linebacker continues to lead Texas in tackling in seemingly every game. Saturday night Muckelroy registered 12 tackles, most coming in the middle of the field. Tech had a little success running the ball, but in the second half Texas’ defense shut out the Red Raiders until their last drive of the game. [tag]Earl Thomas[/tag] – Most people will only remember the last play of the game where the freshmen tried to undercut Harrell’s pass to Crabtree allowing a touchdown pass. 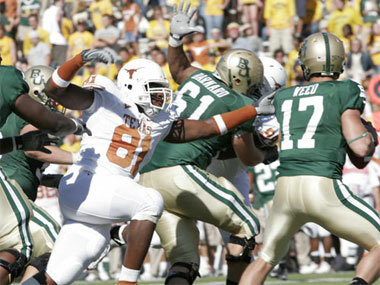 What most people won’t remember is that Thomas was playing maybe his best game as a Longhorn before he took that chance at the end of the game. Thomas had ten tackles with two pass breakups on the night. [tag]Foswhitt Whittaker[/tag] – Fozzy has been struggling all season to get on the field. Early in the year he suffered through two nagging knee injuries only to see senior Chris Ogbonnaya secure the running back position by the time Fozzy got back healthy. The Texas staff didn’t allow the speedy freshman to make an impact until the second half, but when they did the potential big play ability he brings to the position was clear. On a night where Texas could do nothing on the ground Whittaker averaged seven yards on six carries in limited action. [tag]Roy Miller[/tag] – When Texas did apply pressure it seemed the big man in the middle was the one applying it. Miller went down with an injury during the game but was able to get back on the field. Miller has been the most consistent player on the d-line this year. 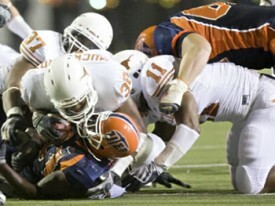 He finished the game with five tackles and one of UT’s two sacks. [tag]Hunter Lawrence[/tag] – You know it is bad when a kicker made an impact in a loss. Lawrence continues to be the model of consistency going two for two on the game. Lawrence has been perfect on the season even though he entered it without being expected to get the job. [tag]Aaron Williams[/tag] – The true freshman doesn’t get the chance to play as much as the other corners, but he continues to stand out every time he is on the field. Williams is quickly becoming a playmaker on special teams recording another blocked punt against Tech. He recovered a fumble, had two pass breakups, and made a great play on a screen pass during the game. [tag]Justin Tucker[/tag] – Two kickers on one list? I know, I know, but try to find someone who made more of an impact than Tucker. The rugby style kicks he utilized on Saturday night ended up working extremely well for Texas as they averaged over 50 yards. Tucker also continues to get his kickoffs consistently into the end zone.